In February, we wrote to you about the imminent demolition of two Arab Bedouin villages in Southern Israel, Umm al-Hiran and Atir. "(It's okay if you don't remember -- I've attached the email below to jog your memory.)" Our allies, "Jewish Coalition for the Bedouin of Umm al-Hiran and Atir", asked us to raise the alarm about the demolitions, and show the Israeli government that the world was watching. That's exactly what we did -- over 10,000 of us emailed Benjamin Netanyahu, and urged him to step in and prevent the demolition. But now the villages are under threat again, and we need to act fast. The Jewish National Fund (JNF) is working hand-in-hand with the Israeli government to move forward the demolition of the villages, establish a new Jewish town, and plant a forest on the land where Arab Bedouin people have built homes, farms, and mosques. 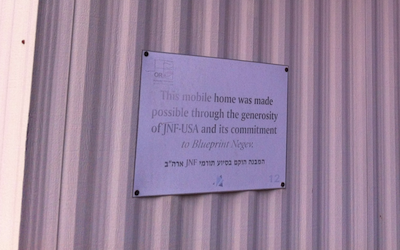 I guess we shouldn't be surprised: the JNF has a long and sordid history of funding displacement in Israel/Palestine. But they've been getting away with it for too long, and we can't stand for it any longer. These Arab Bedouin communities were displaced from their ancestral land in 1948. They were displaced again in 1952 and again in 1956, and forced to move to Atir and Umm al-Hiran. And now they're being displaced once more, so that the JNF can demolish their homes to plant a forest and make way for Jewish settlers. It's a pattern being repeated across Israel/Palestine, but this time we have a chance to stop it. The JNF is able to continue expelling non-Jews from their homes because they think that none of us are watching. They think that none of us care. On Friday and Saturday night, Jews around the world gathered at seder tables to celebrate Pesach, and the exodus from Egypt. We recommitted ourselves to the idea that in every generation, every single person must feel as though they themselves were liberated. How do we put that into action? This is one of the ways. Our voices can help stave off the threat of eviction and dispossession for the people of Atir and Umm al-Hiran. And what better way to celebrate Pesach than that? The Israeli Supreme Court has ruled that the expulsions in Umm al-Hiran and Atir should go ahead. But Prime Minister Netanyahu has the power to stop it, and if we show him the world is watching, he just might. The coalition turned to us because they know that our community steps up when asked to speak out on grave injustices like this one. The New York Times and other mainstream media outlets hardly cover this story, but it's happening, and it's happening now. Across Israel, non-Jewish people are being forced out of their homes to make way for new Jewish settlements. Houses are demolished and communities ruined, so that new Jewish homes can be built -- on the rubble of houses where non-Jewish families lived for decades. I know what you're going to say -- "why would we think we could have any influence over the Netanyahu government, probably the most right-wing and racist in Israeli history? " But when we raise an international outcry, they have no choice but to pay attention. Over the summer, we wrote to you about the village of Susiya, which is facing demolition by the Israeli military. Thousands of you raised the alarm, and as part of a coalition of many organizations, we stopped those demolitions -- at least for now, as the villagers fight on. What the residents of these villages want is to live with dignity, in peace with their neighbors. Expulsion and land theft is endemic across Israel, the West Bank and East Jerusalem. Whether it's the demolition of homes in Susiya, Airbnb vacation rentals on stolen land in Palestine, or the expulsion of Bedouin communities from Um al-Hiran, we're committed to fighting back. Thank you for fighting back with us.